FIREWALL: QFES shared this harrowing image that shows just what firefighters are up against as they continue to battle fires across the state, including Deepwater. COMMUNITIES should brace for not only fires but the chance of a tropical cyclone could form off the coast in the coming days. The Queensland Disaster Management Committee met this morning to discuss what the State can expect in the coming days. Authorities say it is too dangerous to return home for those people evacuated from the Deep Water area. 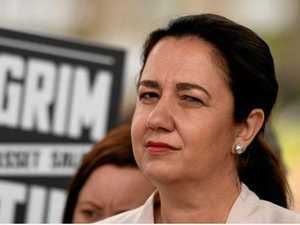 Queensland Premier Annastasia Palaszczuk addressed the media saying we still had a long way to go. She advised people to keep an eye on the news and have their phones close by as alerts would come through. "Of course there is a long way to go," she said. "We still have extreme weather conditions over the next three to four days." She said because of the dryness and the fuel on the ground, anything could happen. 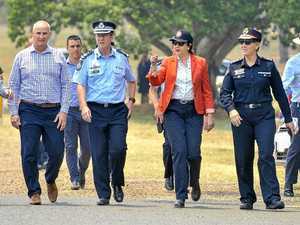 "We have 114 fires across Queensland as we speak," Ms Palaszczuk said. 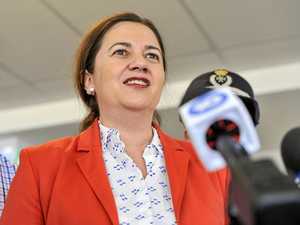 Ms Palaszczuk said it was not only the fire situation we should be wary of as there was a 20-50 per cent chance of developing into a cyclone early next week. QFES Assistant Commissioner Gary McCormack said we will see very high fire dangers across most Queensland for today and the days ahead. "We do have a total of 37 fire bans," he said. "The Deep Water fire continues to be a challenge for crews. "We are still operating there with a significant amount of resources and we will continue to do so for a several days at this point, unless we get a change of conditions which is not forecast. "The game is not over." 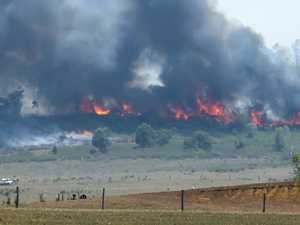 A Bureau of Meteorology spokesman said there would be elevated and challenging fire conditions would be seen across the state in the next few days. "The reason behind this is we have server to extreme heat wave conditions persisting across the state," he said. 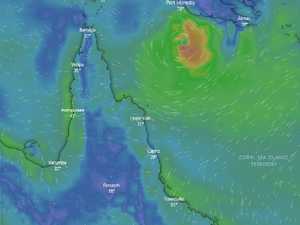 "There is also a moderate chance of a tropical cyclone forming in the northern coral sea. "We are currently analysing a system up near the Solomon Islands. "There is a lot of uncertainty so keep an eye on this space." If the cyclone is to form, it is not clear when or where it would impact. He said the heat would continue and many communities across the state had broken records in the last few days, with catastrophic conditions across Central Queensland. 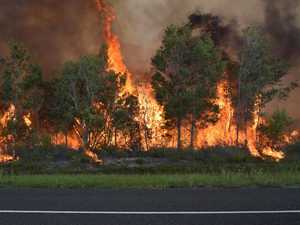 "We have never had catastrophic fire conditions occur in Queensland before," he said. Mr McCormack said the fires were extremely dynamic and wind could change without notice. He said people in the Deep Water area would not be allowed to return home until it was safe to do so. "We need to make sure we are 100 per cent confident before we return people to their homes," he said.